The confocal chromatic confocalDT 2421 and 2422 controllers combine precision and high speeds in distance and thickness measurements on various surfaces. The new dual-channel model is especially suitable for the glass industry. As well as non-contact distance measurements on diffuse and reflective surfaces, the confocal measuring principle enables thickness measurements of transparent materials. 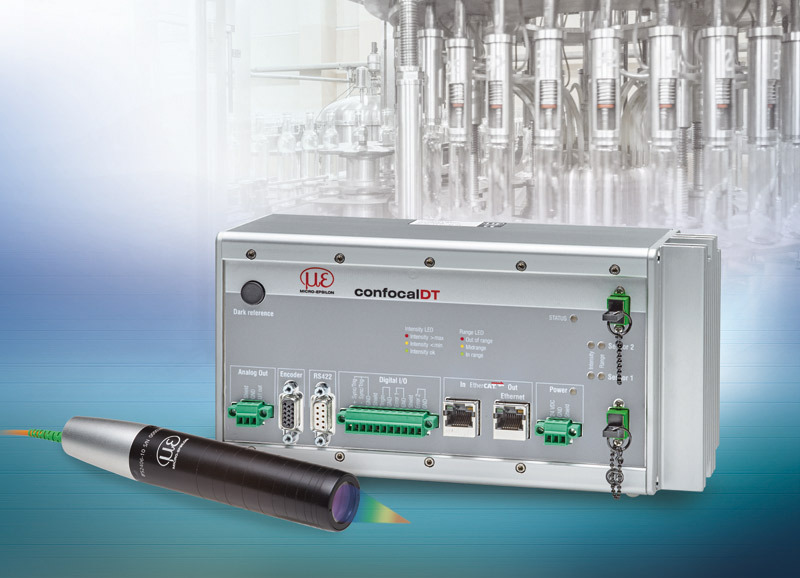 Particularly for measurement tasks in the glass industry where typically high throughput rates occur, the new confocalDT 2421 and 2422 confocal controllers are ideal. Therefore, it is possible to perform multi-track measurements on flat glass, two-sided thickness measurements and multipoint thickness measurements on container glass using only a single controller. In container glass production, wall thickness and roundness of the bottles are crucial quality features. This is why these parameters must be 100 % inspected. Any faulty containers are immediately rejected and returned to the glass melt. Due to high processing speeds and in order to prevent the bottles from being damaged, a fast, non-contact measurement procedure is required. The confocal chromatic confocalDT 2422 dual-channel measurement system from Micro-Epsilon is ideally suited to this measurement task. The system measures synchronously on two points. Data is output in real time via an EtherCAT interface. The thickness calibration feature enables precise thickness measurements across the entire measuring range of the sensor. Automatic exposure control allows stable measurements regardless of the glass color. As well as in the glass industry, the systems can also be used when measuring oscillating metal sheets, for quality assurance purposes in mobile phone production and in OEM applications.